Hdello everyone. One thing that I noticed we were lacking was a place for our graphic artists to show off their work while it is being made. So, here we are! Resource Work In Progress Thread of Magic and Wonder! Ok, that is a little overboard, but that is what goes on here. Some RPGMaker artists truly do work magic and leave you wondering how the hell they did it, so that is why it had to be said. Anyways, if you have something that you have been working hard on and you would like to show it off and get feedback on it, here is the place to do it. NOTE: This is not the place for requesting, flaming, or hatred of any kind. Criticism is the whole point of posting here, but there is a fine line between helping and hindering. Remember that. Well, I think I will start us off by showing everyone a tile I have been working on. Now, some of you already know I have been doing Modern Tiles, but you don't know yet that I am also planning on doing numerous new Overworld Tiles as I feel the ones we have now are a little restricting. Anyways, my first one is a larger version of the Ace RTP Oasis tile. The one provided to us was a 1x1 tile with very little detail. 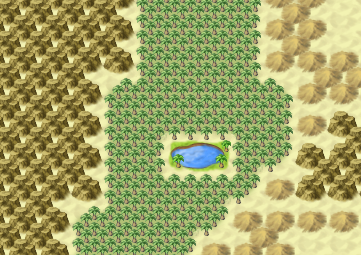 I feel that some games just require a bigger Oasis in the desert (probably because I required a bigger Oasis, lol). Note that this is from scratch, so it may not match up exactly, but I feel I have gotten somewhat close. Here is the original Oasis Ace RP tile. Here is my new Oasis tile. And here is a quick picture of how it looks in-game. So there you go. Let me know what you all think. Wow, that actually looks like it belongs in the default Rpg tiles! Graeat job on these! Well, I dont plan on releasing any tiles that wont fit with the RTP. I want all of my work do be usable easily to anyone who wants it. And I made it in Paint.Net, as with all my works. And Net... Thank you. Thank you too Dawning Star. 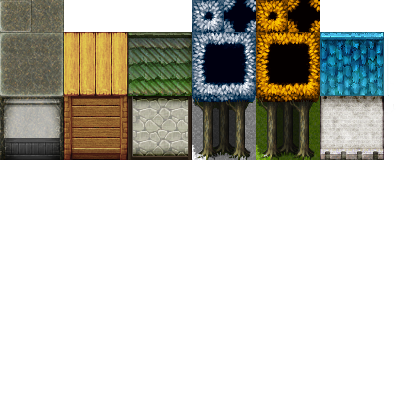 A windowskin (It's finished though) and roof tiles I've been working on for the Beta Contest. All credits to EB and Mack. :3 Constructive criticisms are highly appreciated. Very Nice Reisen, very nice. I am very pleased you are working so hard on the contest.